Hey! Hi! So tacos on Tuesday… pasta on Wednesday! I can totally handle that!! Especially a pasta like this. 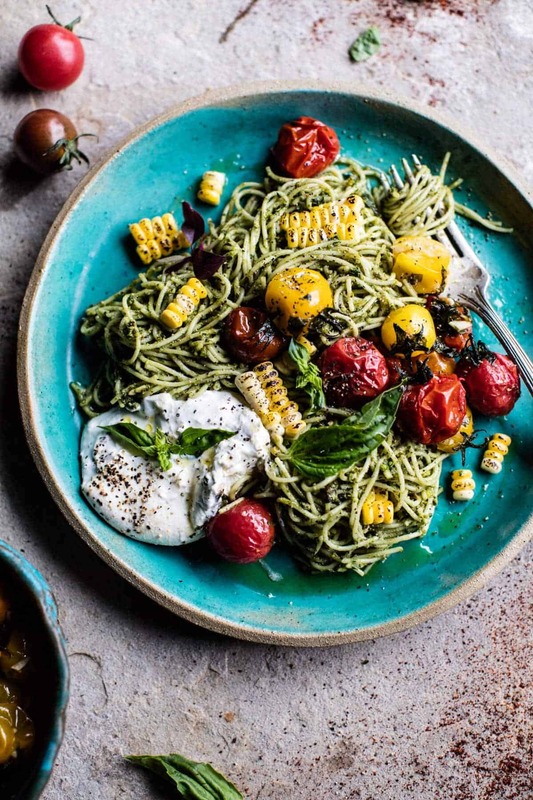 One with basil, grilled corn, charred tomatoes and a big ball of burrata. Yes, I am definitely OK with that. It’s basically summertime on a plate! I know summer is still more than a month out, but I think it’s pretty clear that summer is the season I am craving. I am DONE with the snow, ready for warmth and ready for relatively lighter meals. Granted I don’t really get that much of the warmth where I live, but I’m pretty pumped about the food! 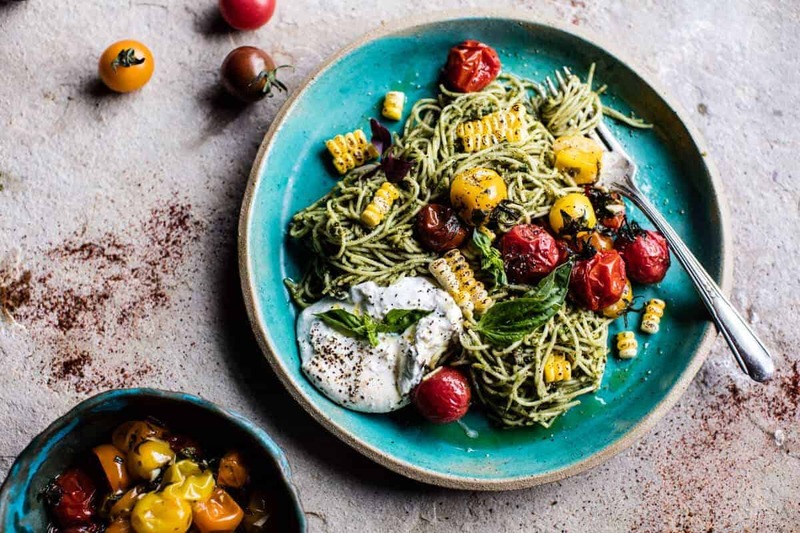 Here’s the deal, I am not trying to jump a season (well maybe just a bit), but my grocery store had the most gorgeous looking sweet yellow corn and heirloom cherry tomatoes. Obviously I couldn’t resist getting like ten ears and a bucket full of cherry tomatoes. I have this problem…when something looks amazing and too pretty for words, I have to like, buy them all up. It’s a fear not only of not having enough, but that the next time I go back to the store, all that pretty little produce will be gone. And yes, clearly I am not the world’s best at sharing. Oooops. OKok, so serious talk though. One, this pasta, like tell me that it excites you as much as it’s exciting me, right? I know it’s simple, but the flavors?!?! You really can’t beat them. 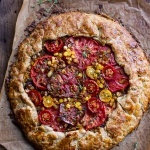 Never will I tire of basil, tomatoes, cheese and corn. Never. Two, and this is totally random… but my brother text me asking for serious help. He and one of his “hommies” are having a biggest loser contest to see who can lose the most weight and he needs to know what to eat. Creighton LOVES food. In my opinion, not particularly good food, but the kid loves food. I’m talking, steak, wings, burgers, fries, any and all Mexican (as long as it has zero quinoa… or at least as long as he isn’t told there’s quinoa in it), pizza and basically anything that’s not green. We could not be more opposite in our eating habits, but I do love pizza and Mexican for sure. Anyway, his text pretty much made my Monday night. It made me laugh, and laugh hard, and it made me happy because I think he is actually semi-serious about eating slightly healthier. Yeahh!! Sorry, now back to the pasta…but I had to share that with you, it just made me laugh. You’d get that even more if you knew Creighton. Lol. 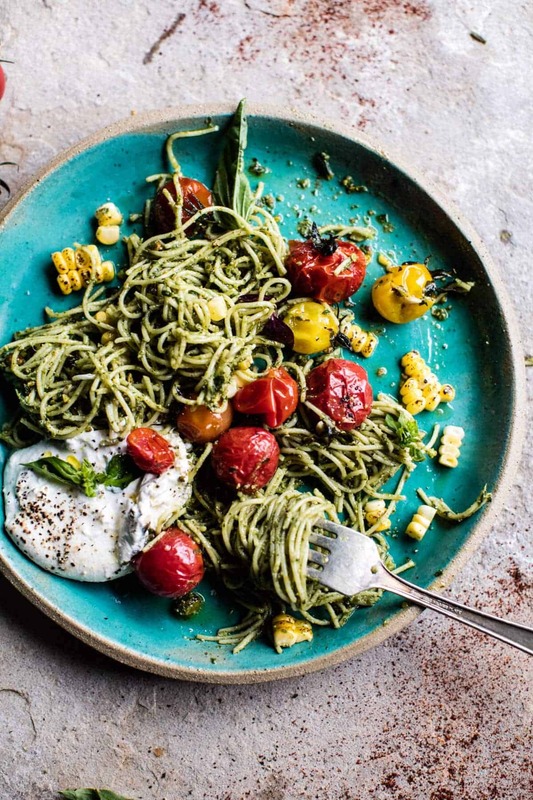 So, Charred Tomato and Corn Pesto Pasta! And then that’s it. Add some burrata and DONE. Oh, but a quick note, you can use any cut of pasta you love, long or short. I grew up on angel hair, so when in doubt I go with that. Plus it takes like two-three minutes to fully cook and then it’s ready to go. Perfection. 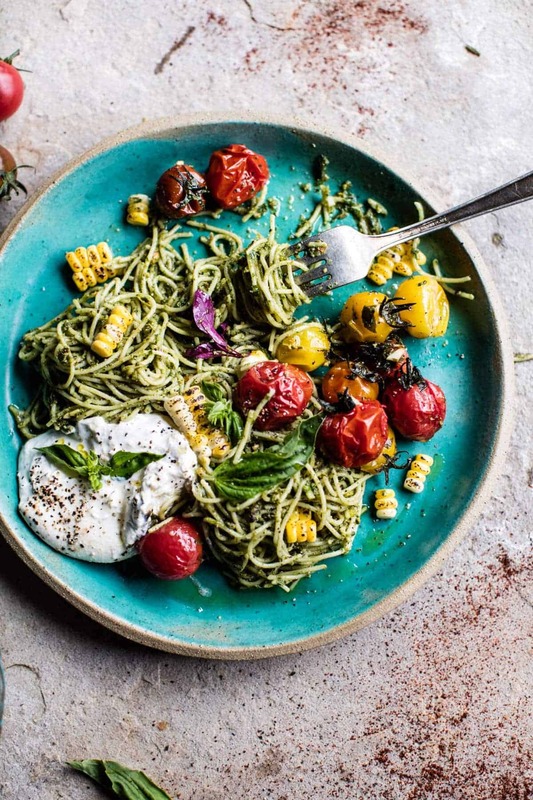 Basil, grilled corn, charred tomatoes and a big ball of burrata. Yes, I am definitely OK with that. It's basically summertime on a plate! 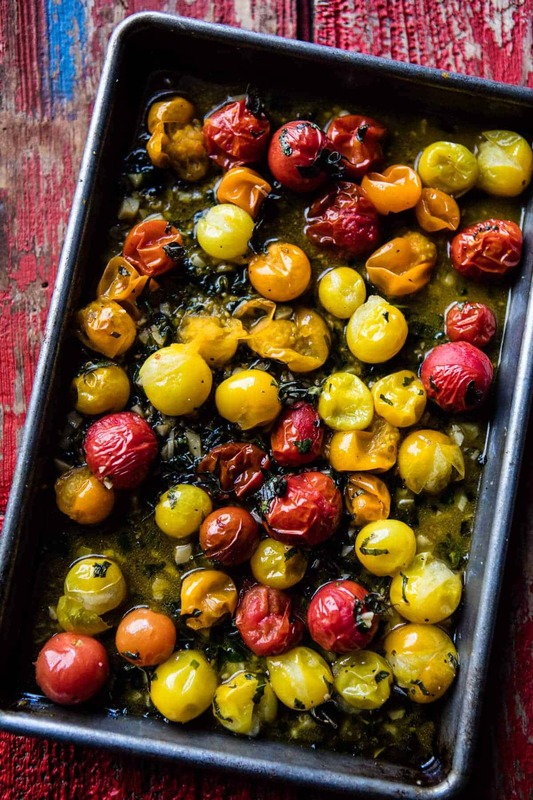 Add the cherry tomatoes, olive oil, fresh chopped herbs, minced garlic and a generous sprinkle of salt and pepper to a baking dish. Toss well, making sure the tomatoes are well coated in olive oil, herbs, garlic, salt and pepper. Roast for 10-15 minutes or until the tomatoes collapse. Meanwhile bring a large pot of salted water to a boil. Boil the pasta until al dente and drain well. 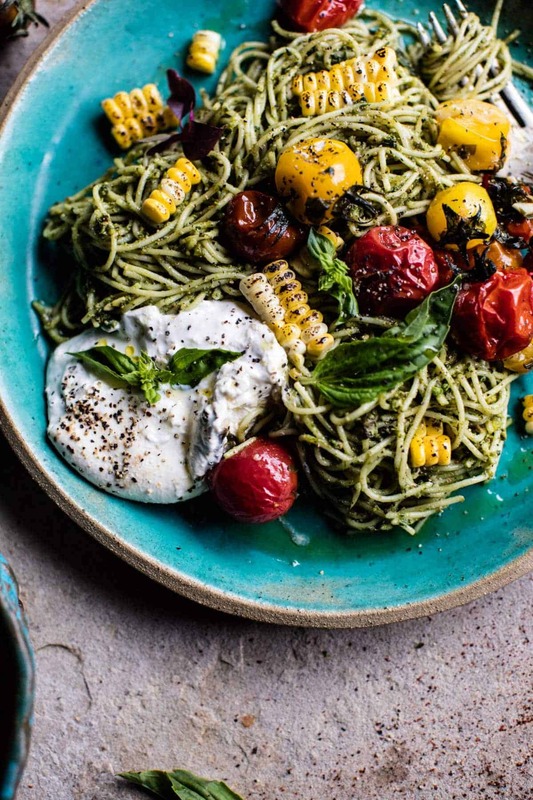 Add the pasta to a large serving bowl and toss with the zucchini and basil pesto. Add the cherry tomatoes and grilled corn. 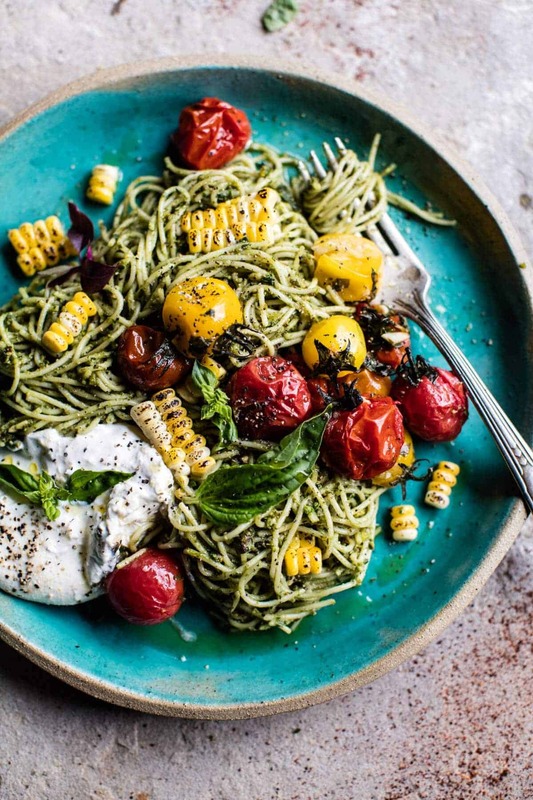 Break the burrata over the pasta. Sprinkle with crushed red pepper flakes and fresh basil. EAT! In a blender or food processor, blend the basil, olive oil, vinegar, garlic, 1 teaspoon of the salt, and a pinch red pepper flakes until smooth. Taste and adjust salt as needed. HAHA! That is amazing!! I’m so happy you like the blog!! Thank you Dina! I love all the things your brother loves–ugh. 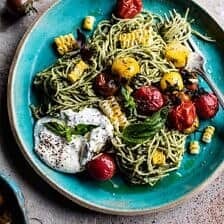 I really like this pasta and corn dish. Thanks again for a beautiful dish I can serve family and guests as well! Sorry I don’t comment often,…..It’s hard to type while holding a fork! LOL! Thank you so much!! No need to set the fork down! That’s so awesome that Creighton wants to eat healthier and that he knows who to go to for help. My little bro keeps starting a “diet” for like 5 minutes and then seeing a cookie and saying screw it. Ha, so hopefully your brother has more willpower than mine. 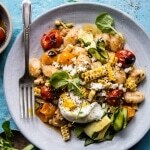 Ok, this pasta is so freakin’ amazing! Like, who cares about what season it should be in, I want it NOW! Right? Im impressed! We’ll see how he does! But thanks Tori!! Hope you love it! Yay! I do to!! They’re so good! Thanks Ivana! 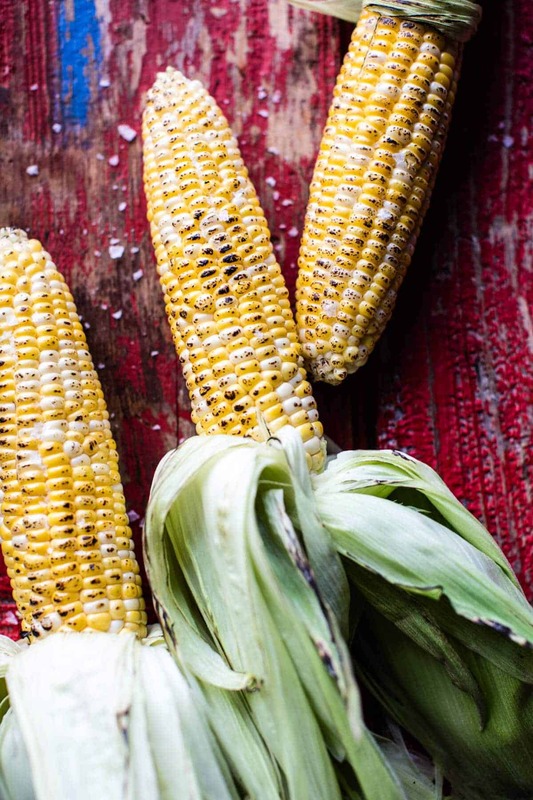 Grilled corn is my fav! Nothing better than the fresh summer corn SO close to coming out! I Agree! And I cannot wait! One thing we do is have protein shakes sometimes. Love them and it makes me think I am drinking a milk shake. HA! I make it real thick with frozen banana. Protein shakes are great!! Especially when you add some deliciousness like bananas! Beautiful and tasty looking dish! That is so awesome that your bro wants to take back his health! I’m guessing with the foods you listed that he eats, they are probably mostly processed foods? I would encourage him to begin eating foods that he can make himself from scratch. Get the processed junk out and begin eating whole foods. He would most likely totally rock that contest if he could focus on that and he’s got his sister’s blog for whole food recipe inspiration! ? Hey Shannon!! haha! Yes, it is mostly processed foods and yes, I could not agree more with you! No processed foods! I will try to stick this in his head! ? thanks again! I really want to eat this! I love charred tomatoes!! SAME! Hope you love it! Thanks Miranda! HI Renee! I either grill my corn on the grill for 8-10 minutes, turning it 2-3 times while cooking OR I put it under the broiler for 3-4 minutes, turning it once in the middle of cooking until it’s charred. Let me know if you have questions. Hope you love this and thank you!! 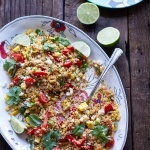 This dish does remind me of summer on a plate Tieghan! All my favorite ingredients. Adding to my summer menu! Awesome! Thanks a ton Mary Ann! We just had this for dinner. It was delicious! I grow lots of herbs so it was a good dish for me to use tarragon, oregano, chives, and parsley (and basil of course). Big hit with everyone…especially my vegan daughter. YAY! Thats awesome! I’m so jealous! Glad you liked it! Thanks Stacy! Hey Natala!!! Thank you so much for your words of wisdom!! I am not sure what the deadline is, but I will give him all this info!! Hoping he can make healthy lifestyle changes! thank again! ? Eat lots of fresh fruit and veg. Or even more simple just totally up the amount of water he is drinking per day, esp. if he adds lemon juice to it. 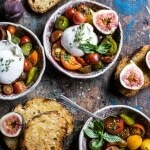 Am I the only Vegan/Vegetarian obsessed with this blog? I find so many of your rich and beautiful recipes easily adaptable. Woowoo!! I agree!! Thanks Laura! Looks delish! Do you cook the zucchini or just eat it raw? Also could this be made ahead and reheated for the salad? I do lunch bunch at school and this is my week to cook. Thanks in advance! Hey Margie!! You just eat the zucchini raw and yes, this would be great to pack as lunch! Let me know if you have questions. Hope you love the pasta!!Thanks!! I made this recipe last night and myself and my husband loved it! I added shrimp and used goat cheese instead of burrata and it was scrumptious. The basil vinaigrette was a welcomed departure from traditional pesto because it wasn’t heavy and had a bite from the red wine vinegar. Absolutely yum! Sounds amazing!! SO happy you two liked it! Thank you for making it Leslie!